Thanks for the suggestions Pete. I have to have a reader that reads in * F. Past “o” and “100” I can not visualize * C.
Hey, they improved the temperature forecast for our area a bit: Only 2 nights with temps below -20°F, instead of 3. Good thing all our pipes are buried 8 ft underground! Those thermocouplers are not marked ungrounded, if they are grounded, they will not work on a shared ground system. I don’t think the read out matters as long as they are 12v neg ground. Al- if you are talking about the meters with internal battery power, I don’t see why there would be a problem. They are NOT sharing a ground. No, the thermocouplers you listed from eBay are probably grounded, and won’t work using the vehicle’s electric. I was just thinking that calling between countries in Europe, was more like calling between states over here. You and Kristijan do talk on the phone don’t you?? I think both you and I would be able give Max a call just fine if we only had his name and/or number. I can understand both you and Kristijan just fine on your videos. Can’t wait to try in person at Argos! On my slide in unit I use a dual remote barbecue thermometer. In the Ranger I use the exhaust type K couplers, I like the set up in the Ranger much better. I think it is time for a review of Carl Zinn’s posting on thermocouples; Here you go Andy, All our standard use TC’s only have 2 wires and the grounded designation means the TC is connected to the case. They will not work with the cheap digital readouts because they power off of the 12 truck power that has negative connected to the chassie. PS The yellow HF meter is the one I have that times out on me and I was looking to mofify. Tom I’ve tried the same reader with both types of couplers, the grounded one will not work, but the un grounded does. Tom, on my Geo Tracker I could not make the thermocouple readers work either when powered by the vehicle electrical system. After I used a garden tractor battery that I recharged separately from time to time the readers performed perfectly. 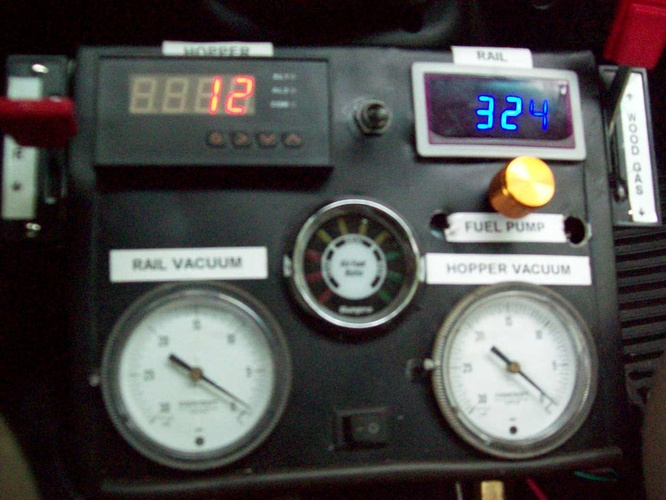 Carl Zinn used a small 12v to 120 inverter and plugged in a 120v to 12v converter (power supply for electronics) to isolate his TC readers from the vehicle electrical system. 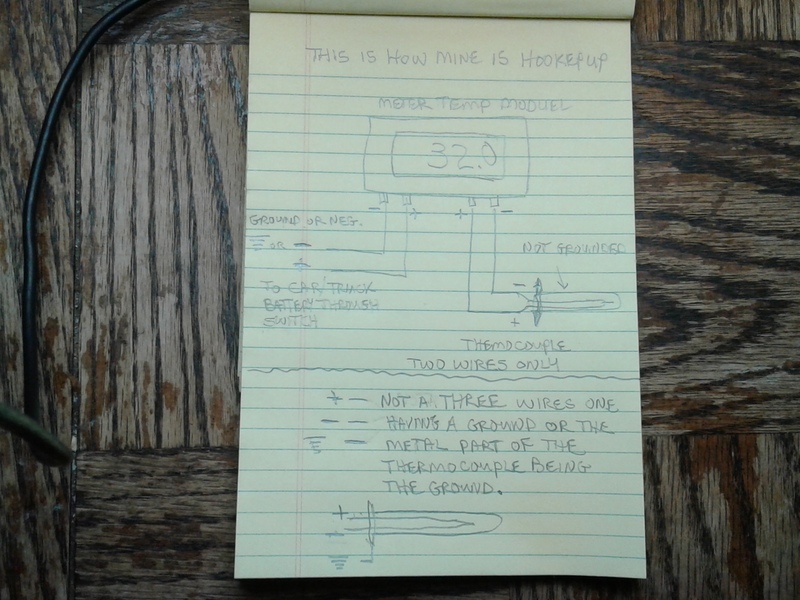 Hi Tom, I made a wire diagram of how my K type thermocouple and temperature read out meter is hooked up for my grate. It is the same for the hopper, cooling rails.